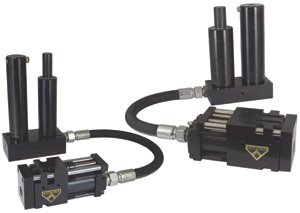 Dadco, Plymouth, MI, introduces Power Cam and Power Pump hydraulic systems, ideal for in-die secondary operations such as punching, piercing, forming or flanging. Available in two force models, 15 and 40 kN, each system comprises a guided hydraulic Power Cam, a nitrogen-over-oil Power Pump and a hose assembly—each sold separately. Power Cam units, constructed of long-wearing close-fitting components, incorporate small Dadco nitrogen gas springs for reliable return/ stripping force. Zero-leakage hose-assembly quick disconnects are optional to ease installation. Request a new 16-pg. color catalog for a thorough product description, operational overview and application examples.